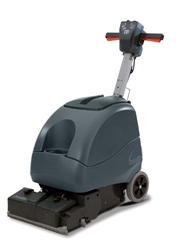 There are many applications where small, highly congested areas must be cleaned regularly and where there is little or no chance of turning a machine. You need to go into a corridor or aisle forwards and come out backwards, it's the only way to do the job. For these types of application our compact cylinder cleaner provides the optimum operational efficiency and, by virtue of the integrated front end dual suction nozzles, it achieves effective cleaning and waterpick up wall to wall... other designs just will not do this! Many smaller machines, however, just do not have adequate capacity to satisfy the floor areain many of these applications on a single tank capacity. Take the retail sector for example, convenience stores are becoming more and more popular and getting bigger and bigger,even in the Sevce Stations. To satisfy these somewhat larger areas we have added a new model to the range, with a full 30-litre capacity, yet based on the super compact 350mm cylinder chassis. The TT3035G has been developed on our tried and tested mains-operation design; providing easy operation, high performance and 100% reliability.